YWCA Hotel v Vancouver, Kanada: Zarezervujte nyní! A little bit of construction for a lot of good. We are expanding so we can help even more single mothers and families. Construction time: January 2019 - June 2020. 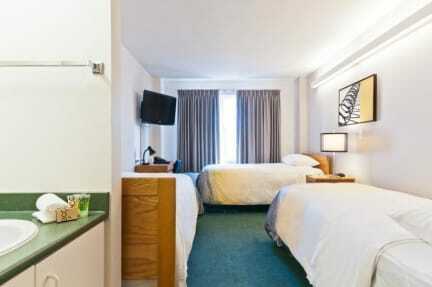 Our guest rooms will continue to be available during this expansion period. Learn more at ywcavan.org/hotel/expansion. YWCA Hotel Vancouver is definitely worth checking into. 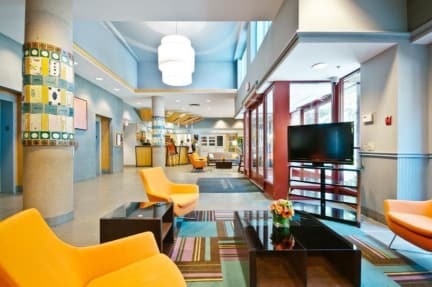 It offers a warm welcome to all travellers, and is a comfortable, safe and affordable place to stay at the heart of downtowns arts and entertainment scene. All rooms are private with their own vanity area and there is a choice to suit your needs and budget -- from single rooms to quints. The 155 room facility has full air-conditioning, mini-fridges, telephones in every room, guest area kitchens, wireless Internet access, laundry rooms, a coffee bar in the lobby and so much more! Located 2 blocks from Stadium SkyTrain Station, the YWCA Hotel is just a stroll away from Robson Street, the city's shopping mecca. Other nearby neighbourhoods worth exploring include Historic Gastown, Chinatown and trendy Yaletown. A 15 minute walk will take you to our Health + Fitness Centre where you can enjoy state-of-the-art facilities including an ozone pool. All rates quoted here do NOT include our Room Taxes. These are due on arrival. Visa, MasterCard and American Express credit cards are accepted.